I wouldn't consider myself a crafty person by any means (as with cooking, I don't have a tremendous amount of patience in the department), but Christmas always seems to bring out what little DIY inclinations I have. (And, of course, a trip to good old Michaels helps too -- their aisles are truly the stuff that Pinterest dreams are made of). While I love the look of a classic evergreen and holly wreath, I thought I'd opt for something a bit easier...and really, this wreath couldn't be easier to put together! 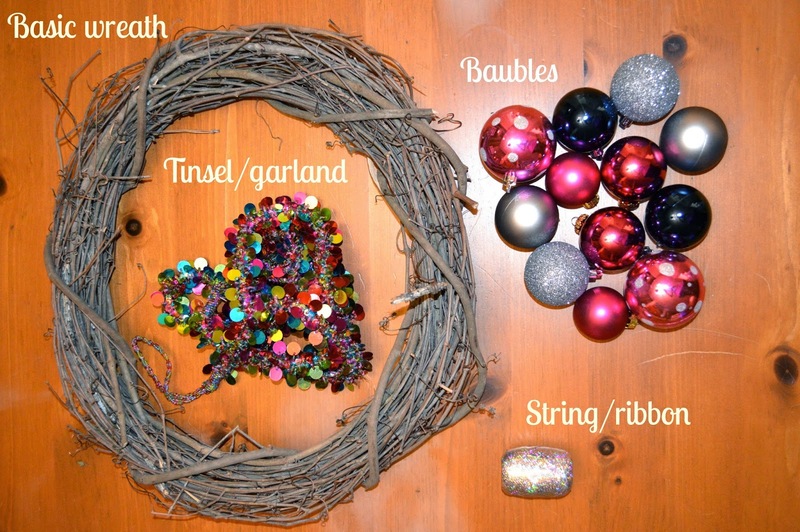 All you need is a basic, barebones wreath frame (like this one from Michaels), a garland of some sort to twine around it, and a handful of bright baubles to tie on with whatever discreet string or ribbon you have on hand. Simple, right?! You can go with multicoloured baubles, or have a theme of one or two colours -- I went with a silver and pink look, with several different types of pink baubles for a bit of contrast/interest. (I initially mistyped "Wreath" as "Wrath" in the title of this post... Somehow I don't think a super simple DIY on Christmas Wrath is something you'd be too interested in ;). Wow! it looks great. You can buy a simple unadorned wreath at Michael's craft store for $3.99. I got one on sale a few days ago to use as my Advent wreath. It looks great. Decorated wreaths are very expensive. It pays to be creative!! I love this DIY! I've been looking at ornament wreaths at all the stores but they're too pricey. This is such a fab alternative!